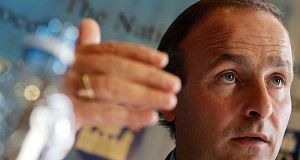 There is growing disquiet and frustration within Fianna Fáil over Micheál Martin’s refusal to back a motion of no-confidence in Health Minister Simon Harris. Sinn Féin president Mary Lou McDonald said Brexit cannot be the “catch-all excuse” to avoid accountability and allow bad governance. She called on Fianna Fáil to support her party’s motion of no-confidence in Mr Harris. Speaking to reporters at Government Buildings last night, Mr Harris said he will fight back against any bid to remove him from office. “I’m disappointed but not surprised [in the motion],” he said. “The fact Sinn Féin has decided to play party politics with this is not surprising, they’re a party that seeks to shoot first and ask questions later and that is not changing. Mr Martin has called on the health minister to provide a full explanation of the escalating costs around the national children’s hospital and to correct the record of the Dáil. Mr Harris is due to make a statement to the Dáil this week clarifying a response he gave to Fianna Fáil’s Barry Cowen last September in which he said the cost of the children’s hospital was “in line with the expected expenditure profile”. This was after he had been informed that the overspend was running at €191m and that contractor BAM was seeking an additional €200m. A number of Fianna Fáil backbenchers and grassroots members are frustrated by this approach and believe the confidence and supply agreement is no longer working. Sligo TD Marc McSharry has already called for Mr Harris to resign and believes it is now time for a general election, but yesterday he said it would be up to the party to reach a collective decision on the Sinn Féin motion of no confidence. However, other Fianna Fáil TDs, including Margaret Murphy O’Mahony and Niamh Smyth, said calling for a head will not deliver any answers and the party cannot risk a general election with a no-deal Brexit looming. However, Ms McDonald said an apology from Mr Harris “falls well short” of the accountability that is now needed. “We will discharge our duties. The big question is will Micheál Martin discharge his?” she said.